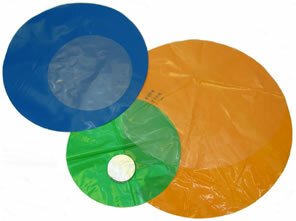 We manufacture polythene discs usually in natural, food grade polythene. Depending on the specification, in different thicknesses and tinted colours. We manufacture in sizes ranging from 25mm to 1525mm. We are able to manufacture to your specification outside of these sizes – please get in touch. In order to size your disc we need to know the diameter you would like. We need to know the following measurement: a) the width (diameter).